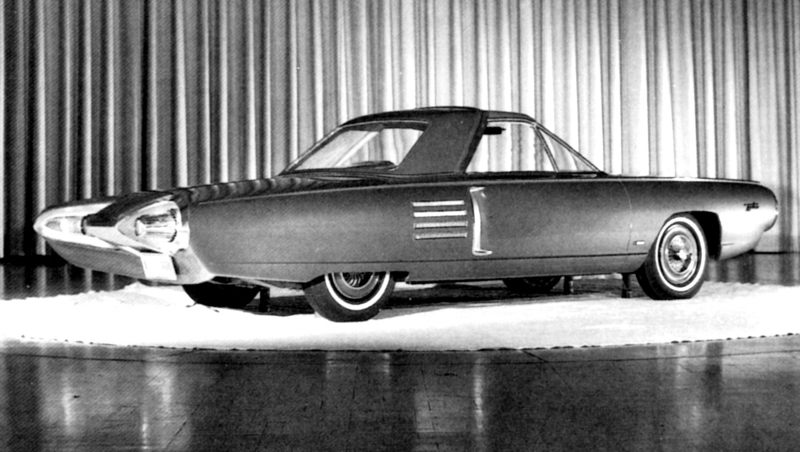 In 1962, Chrysler put together this "mock-up" of what a turbine powered car would look like. Elwood P. Engle was the new director of design and from what I have been told the actual artist who penned the disign of the Typhoon was Mr. Charles Mashigan. Mr. Engle had only been with Chrysler since November of 1961 and maybe it was his input that made them look so much like the early 60's T-Birds or did Mr. Mashigan imagine the style. 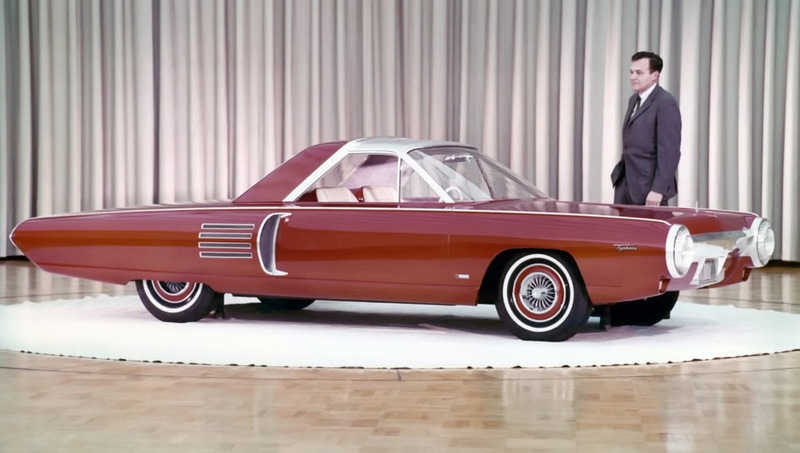 I Know that Charles Mashigan was involved in both the Ghia turbinecar and the Ford Thunderbird design - I also know he went on the be the head of AMC's design department. I would like to know more about Mr. Mashigan - if anyone knows more about him, I would like to hear about it. 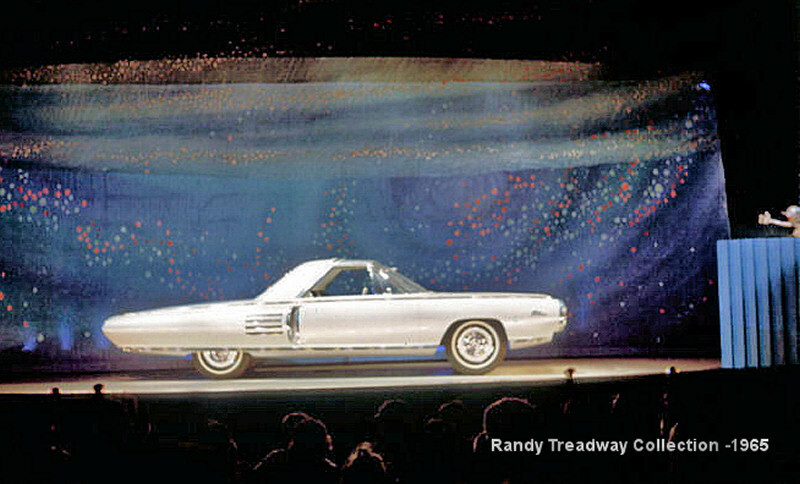 The Typhoon show car was displayed at the New York's World Fair in 1964 and possibly 1965. It had been photographed and displayed before that time but where and when exactly has not been revealed to this writer. As you can see the car has four posts holding it up. From what information I have, it did not ever have a drive-train installed and was in fact supported by a wood frame. It was kind of a "what-if" car, not really a vehicle in the true sense of the word. While there was never a turbine powered convertible (that this writer knows of) this is what the Ghia car we drove would have looked like if they had made one. This was a two-seater and would not have been very practical for use in the testing program. As it was, the limited four bucket seats in the fifty five cars built during the program were not very comfortable for a family with more than two kids. I have been lucky to find another very good photo - Thanks Randy! - this was taken at the Worlds Fair in New York in 1965 - they had the Typhoon in a pavilion there with a little show for the visitors. You can see the perl-white paint job I am not sure if that was applied from the beginning - the black and white photos at Highland Park (above) seem to have the car in a darker color. A friend found this photo in a Google search - first time I have ever seen a color shot of the car in the round photo studio at Highland Park. 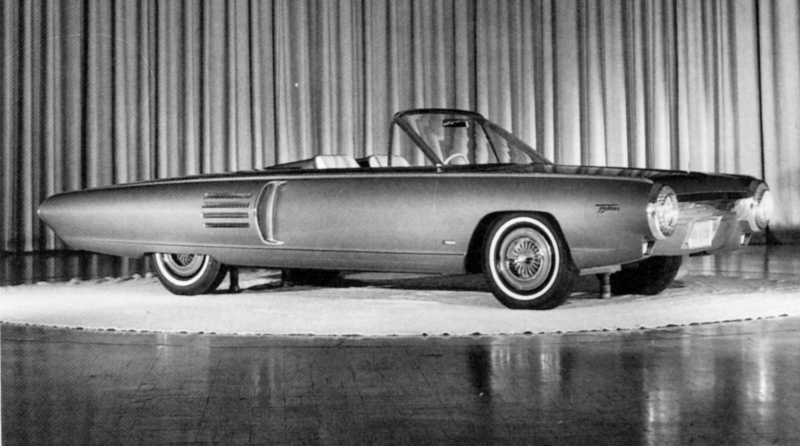 The first body shipped from Ghia to Michigan for the prototype cars was also called the Typhoon. It lost that name somewhere before construction of the actual fifty user cars came about. If anyone knows what happened to the Typhoon or has more photos of it, please contact me. I would guess this was sent to one of the local scrap yards in the same way as the TurboFlite before it was.